iLoud Micro Monitor are a pair of reference studio speakers also known as monitors. Monitors are generally used by musicians to produce the cleanest output possible. The iLoud Micro Monitor can connect to an audio source using RCA plugs, 1/8” stereo input, 3.5mm or bluetooth. The monitors can lay flat, have the front elevated or mounted on a mic stand. There is a an audio settings for each position. The monitors are available in either black or white. Packaging of the monitors are well done. 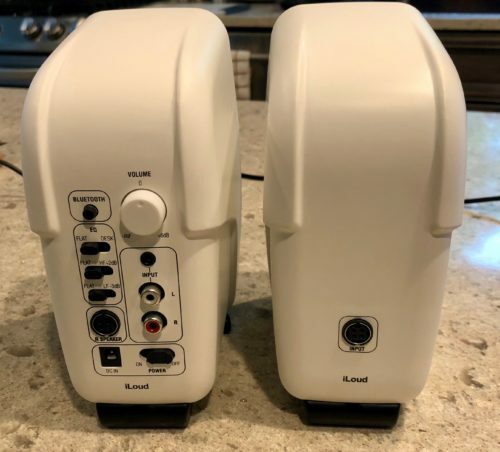 The box includes the monitors, power cable, connector cable, RCA to headphone cable and instructions. The monitors are heavier then expected, but not too heavy where you can’t travel with them. To get started, the first step is to connect the left monitor to the right by using the included connector cable. Next plug in the power and turn them on. You can now either pair via bluetooth or connect to the device using a RCA or 3.5mm headphone connection. The front feet of the monitors flip up to lift the monitor if you prefer and there is a switch on the back to select whether the monitor is laying flat or not. If you have the feet flipped up or the monitor on a mic stand, you would change it to the desk setting, if not its the flat setting. There are also two other switches that change the frequency of the output if desired as well as a separate volume button. I first connected the monitors to my MacBook Pro using the included RCA to 3.5mm jack. I fired up iTunes and turned up some Beatles music. These are loud monitors, the good loud. There is very little distortion as I turned them up as loud as my ears could handle. The music was clear and I was able to hear some things in the Love Album that I never heard before such as some instruments and sounds that George Martin hid in the recording. While the sound was excellent for music, these monitors are really meant for music creation. I launched GarageBand and started playing with the different instrument samples. The sound of the instruments were clear and loud. I am a amateur pianist and have tried many music creation programs, but none professionally. It is amazing to see the progression of the the instrument sounds coming from a computer. The next test was to pair an iPhone X with the monitors using bluetooth. The setup is a very easy process. Press the bluetooth button and look for the iLoud Micro-Monitor device in the bluetooth list and click pair. This worked with no issue. Since one monitor is connected to the other using the connector cable, you are really only pairing to one and then letting the monitors work together. Still, this resulted in some very nice stereo music output. I went back to listen to more of the Beatles Love Album through bluetooth and found the music to be clear and loud. Again, these monitors strengths are how clean and clear the sounds are with very little processing and distortion. Musicians depend on systems like these for performances and to check their recordings. 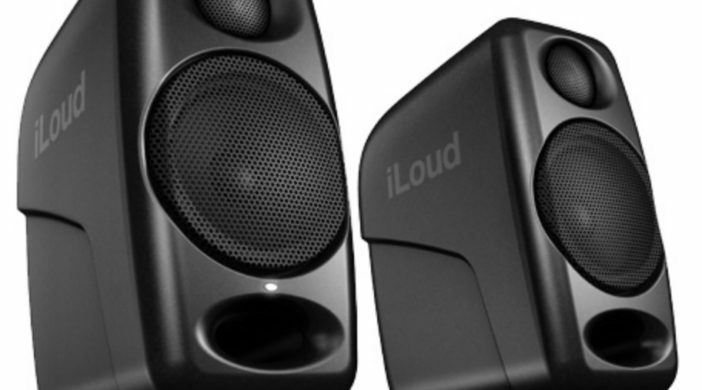 The iLoud Micro Monitor speakers come in black or white and look professional while being attractive. Whether they are on a desk or on a mic stand, the fronts look ascetically pleasing. The one drawback is the connector cable as it takes away from some of the cleanliness of the look. However, there really isn’t much of an alternative to get the same kind of sound. 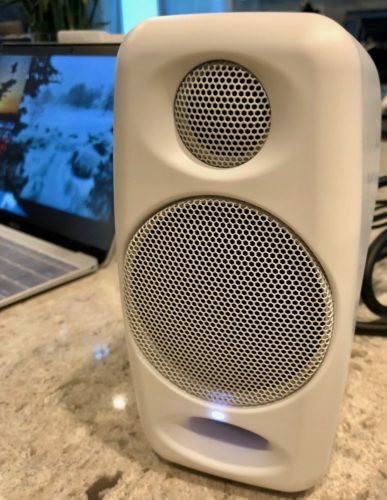 The price range appears to be in the same ball park as other smaller studio monitors, however the reviews by musicians are very positive. As a music enthusiast and amateur pianist, I was also very impressed. 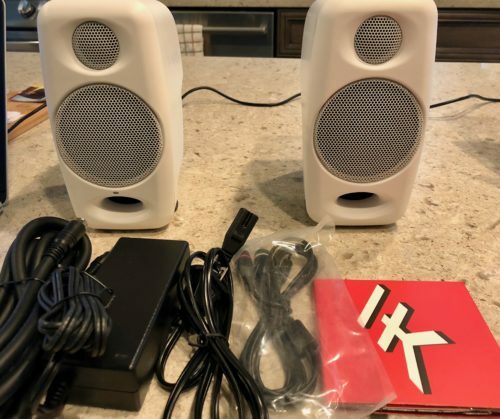 If you are in the music business or just looking to get some very good sound, these monitors would be an excellent choice. MyMac Review Rating is 9 out of 10. Very clear and loud monitors with plenty of connection options for the right price.